Eurodollar rebounded from the group of lower fibo-levels. During local correction, I opened short-term buy order. Closest target is at level of 38.2%, where I placed Take Profit. At H1 chart, pair rebounded from predicted targets right inside temporary fibo-zone. Market may correct for a while during Friday, but later it is expected to start new ascending movement. Pair may reach level of 38.2% in the beginning of the next week. Franc reached its main target and rebounded from it. During correction, I opened sell order with target at level of 38.2%. I’ll move stop into the black right after price reaches new minimum. 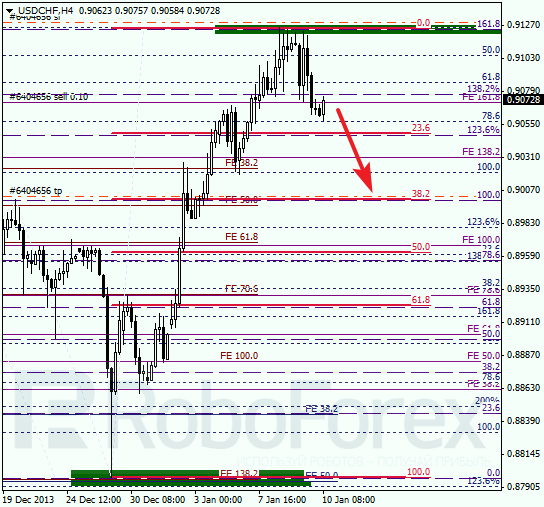 At H1 chart we can see, that market reversed downwards right inside temporary fibo-zone. Closest target is about 100 of pips away, so it may take the market several days to reach level of 38.2%. If price rebounds from it, pair may start new ascending movement.